SageGlass has completed a multitude of high-profile projects this year. Our glass was installed in the 3,500-square-foot rotunda skylight in the Mall of America’s new expansion. It was utilized at the Museum of Science Boston to solve sun glare problems in the lobby, allowing the Museum to create a Yawkey Gallery on the Charles River exhibit that would not have been possible without SageGlass. We also helped the University of Miami’s Frost School of Music, one of the top 20 music schools in the world, create a more comfortable and creative environment for music making while achieving aggressive energy efficiency goals. We’re also gearing up to announce big projects this week at Greenbuild. At Bowie State University, 25,000 square feet of SageGlass will be installed in the new center for Natural Sciences, Mathematics and Nursing on the glass façade and throughout “The Icon,” a three-story atrium and grand entrance to the Center. Once complete, the Center will be a state-of-the-art, comfortable learning facility that is conducive to cognitive thinking thanks to unobstructed outdoor views. The developers of 3.0 University Place have also partnered with us to install 50,000 square feet of SageGlass on the façade of this landmark Class A commercial office building. 3.0 University Place is the world’s first commercial office building pre-certified LEED v4 Platinum by the US Green Building Council. The project also marks the largest installation of electrochromic glass to date. Research and development is at the core of our business – we never stop innovating. At the AIA Convention this year, we featured our LightZone™ technology. LightZone enables the ability to create up to three variable tint zones within a single pane of SageGlass. Further, SageGlass provides architects with additional design freedom for building envelopes because it is available in a variety of geometric shapes and zoning patterns. We also rolled out the SageGlass mobile app. Users can now control and tint specific zones of SageGlass with their smartphone. With the swipe of a finger, users can save customized settings as “scenes,” which can later be activated. 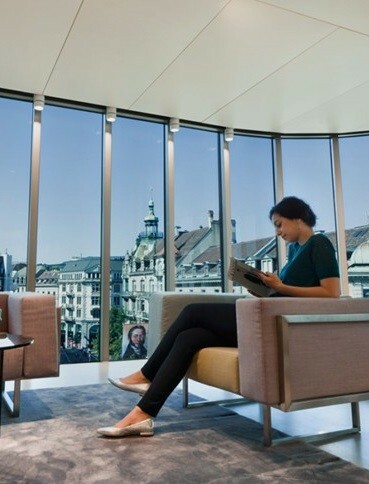 This is just one more example of how new technologies such as SageGlass enable the building occupant to control their environment for an enhanced user experience. A new joint-technology partnership with MechoSystems also helped advance SageGlass’ automated control system. This partnership brings MechoSystems’ award-winning SolarTrac technology to LightZone, enhancing the ability of SageGlass to optimize the influx of light and heat, including depth of solar penetration and management of shadow and reflective conditions. With the integration of SolarTrac technology, we’re extending SageGlass’ position as the leader in electrochromic glazing by enabling even more sophisticated levels of solar control. With all this business momentum, we are expanding our team to meet demand and customer expectations. We recently hired industry veteran Francis O’Neill as the new director of sales and the sales team is continuing to grow with seasoned sales representatives from across the country including three military veterans, two LEED Green Associates, and a former sales and marketing manager from Vetrotech Saint-Gobain, who bring with them a wealth of experience and knowledge. Elijah Black will manage the Miami territory, Charles Howard will be located in Nashville, Kyle Faron in New York, Chris Allen in DC, and Kevin Frisone has moved over from Saint-Gobain’s Vetrotech unit to grow the Chicago market. SageGlass also has a growing team in Europe led by Olivier Gareil, business unit manager. With our Paris-based parent company – Saint-Gobain – the Europe market is a natural fit for rapid expansion. We have already completed a number of high-profile projects across the continent in France, Switzerland, and Italy. 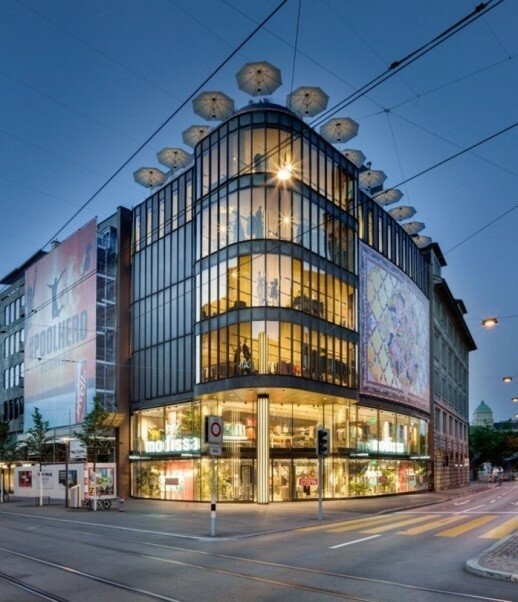 The Modissa AG project, an upscale retailer located on one of the most fashionable shopping streets in Zurich, exemplifies how SageGlass blends both functionality and design sensibility. And the Middle East is also an excellent candidate for dynamic glass due to the extreme conditions of glare and solar heat. We also have a new “look” on the marketing front – our LOOK AGAIN campaign. We’re encouraging architects and building owners to look again at how they approach design and manage the effects of the sun, as well as how they can improve the human experience for everyone in the built environment. Most importantly, we want them to look again at SageGlass. If you are not familiar with electrochromic glass, we encourage you to explore the amazing possibilities. And even if you have looked into SageGlass (but perhaps haven’t tried it yet), it’s a great time to look again. With so many new, enhanced features such as LightZone, 5 x 10 sizes, wireless capability, and our mobile app, SageGlass is well worth another look. To support the official launch of the Look Again campaign at Greenbuild this week, we’ve also launched a photo contest on SageGlass’ Facebook page to encourage architects and building owners to analyze their surroundings and their connection to nature. And, we have our new walk-through Glass Cube debuting at Greenbuild, providing attendees with the opportunity to experience the benefits of SageGlass first-hand. The Cube is located just inside the main entrance to the convention center in Washington, DC – you can’t miss it! As our parent company, Saint-Gobain, rounds out its 350th anniversary in 2015, we are proud of our own growing success and look forward to a strong year ahead.